glowbal grill steaks & satay (formerly known as glowbal grill and satay bar, website, map, 1079 Mainland Street, Vancouver, BC, Canada, phone: 604-602-0835) doesn’t need much of an introduction. Glowbal made international headlines in 2009 when teen-heartthrob Twilight stars Robert Pattinson, Kristen Stewart, and Taylor Lautner were spotted dining at glowbal and other restaurants around Vancouver. But apart from being a favorite of celebrities, glowbal is one of the trendiest, hippest places for the high-class citizen to enjoy superb – dare I say world-class dishes. Our group of incredibly intelligent, geeky, and immensely wealthy software developers from a nearby office were probably some of the most casually dressed patrons at Glowbal today. I’m not sure where all these fancy people come from, but walking through Glowbal at noon on a weekday is like stepping into a movie set from perhaps the opening scene of a Bond spy thriller. The place exudes class and style, and they’ve got everything down from the subtle electro-jazz that pulsates, to the affable and dynamic serving staff who are up to date on the latest social nuances. The food is some of the best I have tasted in this price range (which can be perused on their menu) and is incredibly flavorful, making use of the full palate and leaves me smacking my lips for every last morsel. Well, maybe this time I toned down the smacking, but beware upon the future occasion! 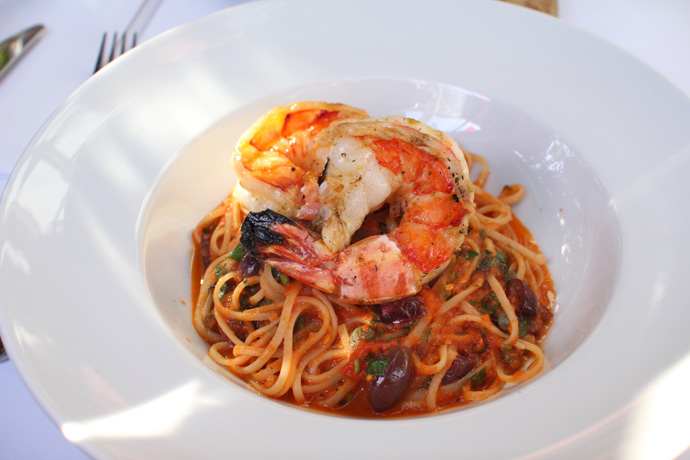 Today I ordered the Linguini off their lunch menu (pictured below), which came with jumbo tiger prawns, tomato, oregano, capers, stewed tomatoes, and of course olives. I’m sure that if you don’t like olives, or only want to eat olives and nothing more, executive chef Erik Heck and his staff will be able to accommodate your special dietary needs. Vegetarians will note that this restaurant doesn’t advertise many vegetarian or vegan-friendly items on their menu. However if you end up at Glowbal I think you’ll do fine if you explain your needs to your server and they will be most amenable to providing tasty substitutions and a dish that you’ll likely enjoy. 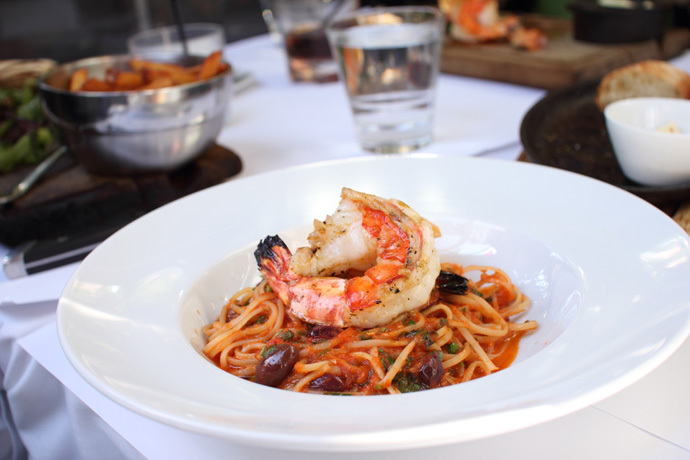 Delicious Prawn Linguine from Glowbal restaurant in Yaletown, Vancouver BC Canada. 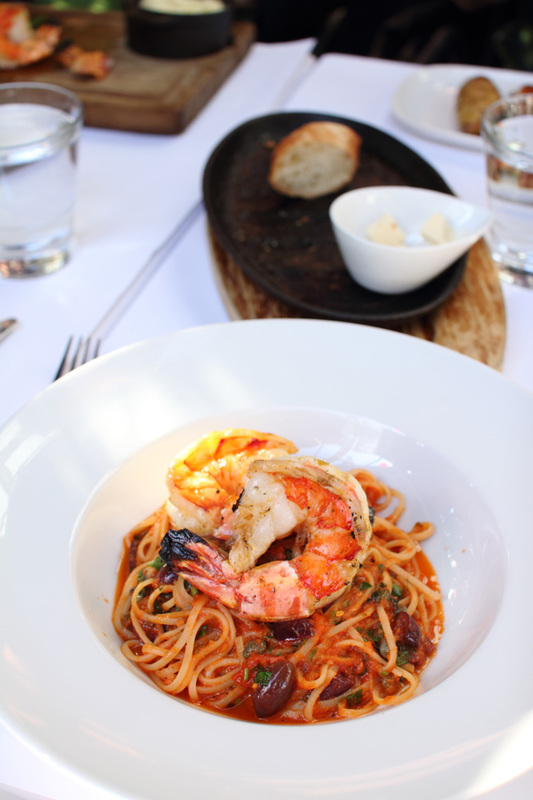 Yummy Seafood Linguine pasta from Glowbal Grill in downtown Vancouver BC Canada. Tasty Prawn Linguine from glowbal grill steaks and satay restaurant in Vancouver BC Canada. 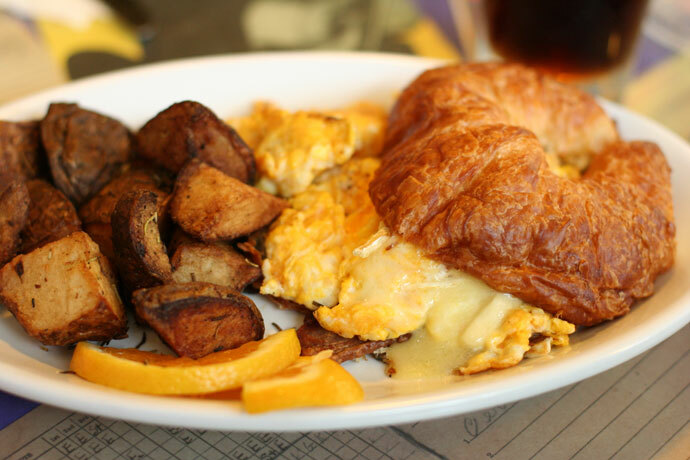 I made another visit to The Templeton (web site, map, 1087 Granville Street, Vancouver, BC, Canada, phone: 604-685-4612) and enjoyed their Mangled Eggs ($8.00, pictured below) which are cheesy scrambled eggs served in a croissant with your choice of veggie bacon or real bacon, and some tasty hashbrowns (potatoes). My friends who were dining with me both ordered the Templeton’s baked macaroni and cheese entree (not pictured), which looked incredibly delicious and healthy too: with some creative ingredients like aged white cheddar, gorgonzola, Italian parmesan, fresh tomato salsa, and side organic mixed greens – a huge step up from good ol’ KD (Kraft Dinner). The Templeton is also a cool place to check out because it has the original furnishings of a classic 1950’s diner, complete with swivel bar stools and a functioning mini jukebox at each table. They show cartoons or movies on the projection screen above the stainless steel bar, and the food is not what you’d expect from a diner: it’s surprisingly modern and updated for healthy lifestyles. They have a good selection of organic and vegetarian entrees as well as some non-vegetarian choices. Serving breakfast until 3pm, the Templeton is open late for dinner too! For more info and photos please visit Part 2 and Part 1. 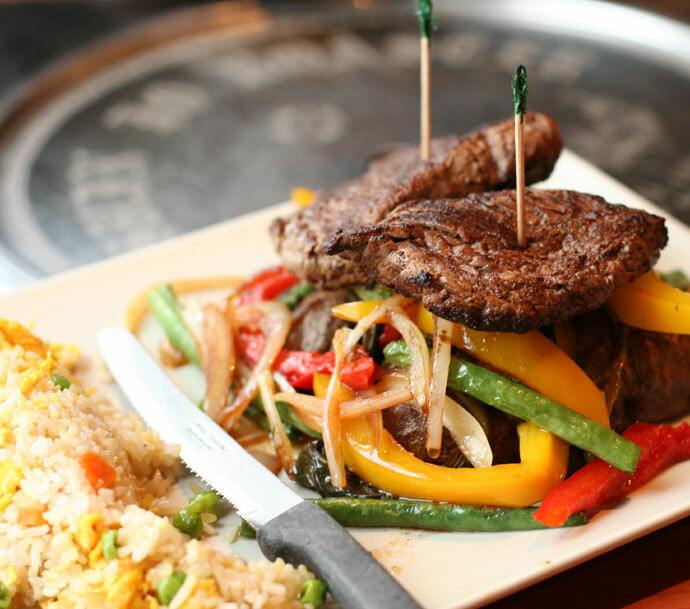 Wild Ginger has quite an extensive menu, with a range of Korean dishes (including Korean BBQ), Chinese food, and even some western-fusion dishes. The Beef Tenderloin (around $18, pictured below), was quite a treat – tender slices of beef were served atop potatoes and stir fried vegetables, with accompanying Chinese egg fried rice that was arranged quite artfully in the shape of a fish. The restaurant is quite large and could easily accommodate a large group (but please call ahead to make reservations so that they can be ready for you!). There is free parking in the mall (upon validation by the restaurant), and the restaurant is very close to the Stadium Skytrain station (Vancouver’s subway). One thing to note is that this restaurant doesn’t have very many choices for vegetarians. My friend wasn’t too impressed by his “vegetarian delight” ($11) which was more of a side dish. But for those who enjoy eating meat or seafood, Wild Ginger has plenty of enticing dinner selections. Check out their web site for the current menu. For another photo and more info please view Part 1. View More Restaurants in the Movies category. We hope you enjoy the great Movies restaurants on Dine Out Here Vancouver.